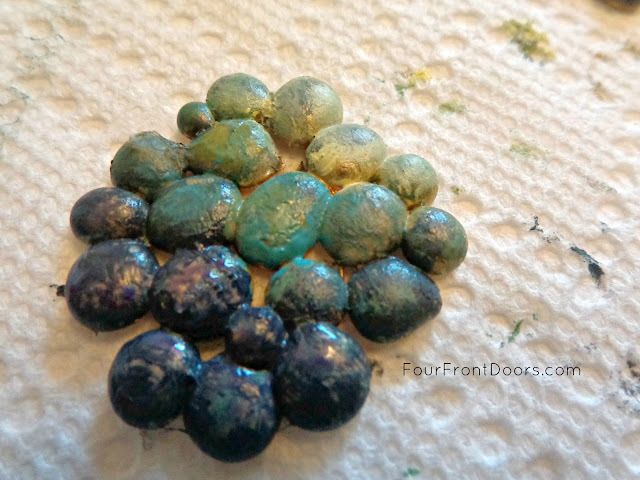 Four Front Doors: Glue Gun Glam! This is a fun way to use items you probably already have on hand for inexpensive, unique and pretty earrings! 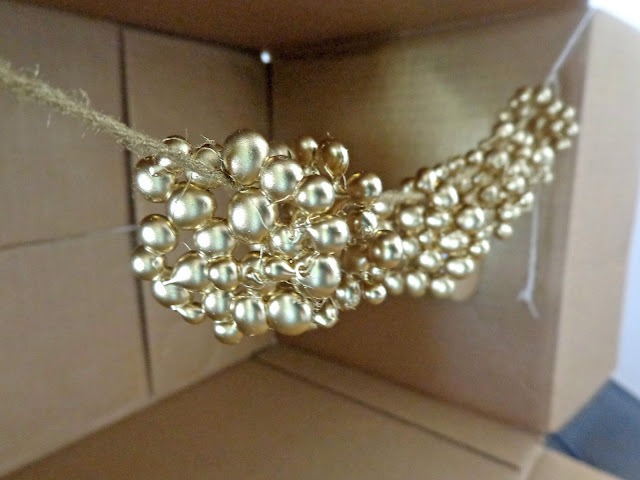 Would you believe the main material for this project is...Drops from a glue gun!? 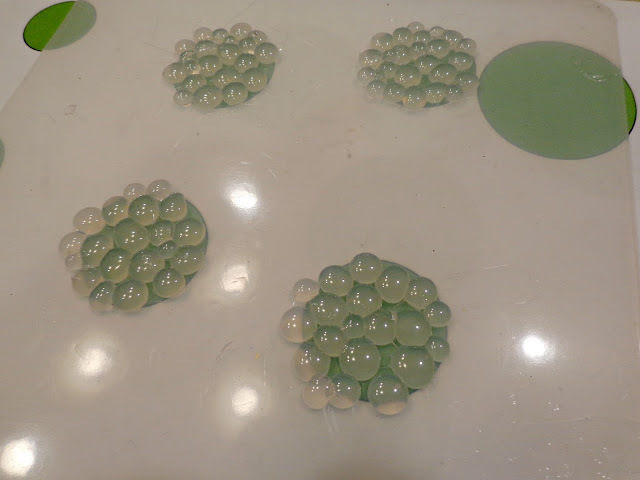 I started by printing off some circles in different sizes, and wound up using ones that were about an inch in diameter. Place the page of circles underneath the silicon mat. 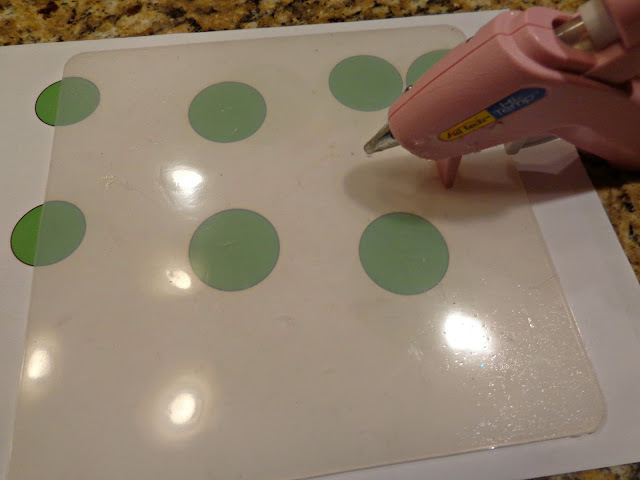 Using the circles as a guide, place dots of glue on the mat, making sure none of them touch! IMPORTANT: Let them cool before you join the dots with more dots. Otherwise, it will all just glob together. After the forms cool completely, spray paint front and backs with gold paint. 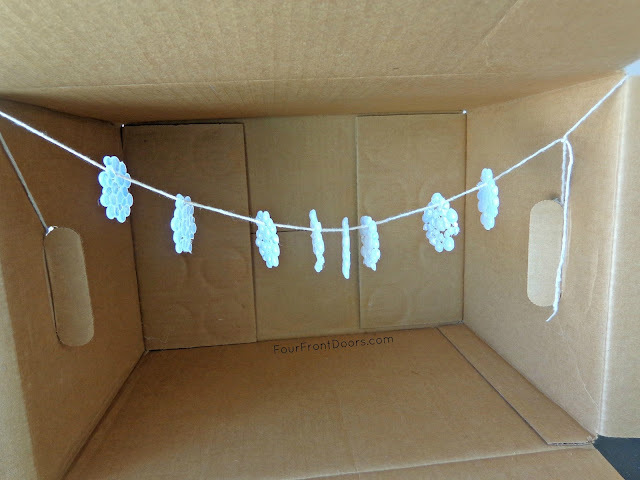 To make this easier and less messy, I strung my forms on a piece of twine and tied it to either side of a cardboard box. Let paint dry completely. Get your acrylic paints together. I used a metallic gold, pineapple yellow, a dusty green, peacock blue, navy, and dark purple. 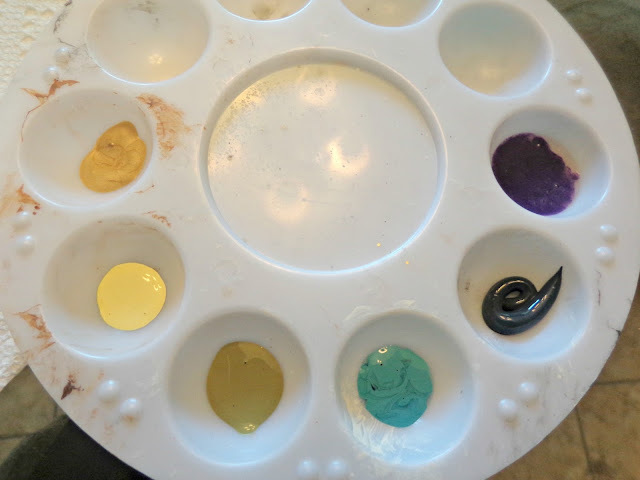 Begin by choosing three colors (I used yellow, peacock, navy) and use one of each color to paint the sections on, then middle, then bottom. You'll probably need two coats. Then just dab on colors in a close shade with a tiny paintbrush, then dab off with paper towel. I dabbed at it until I got a look I liked. I also swirled similar colors together. 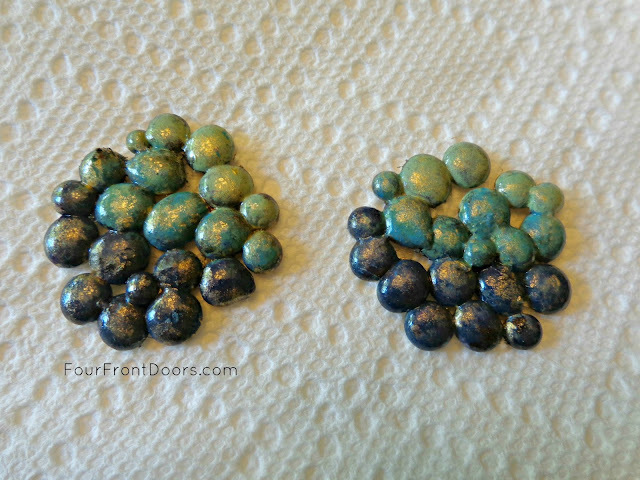 When it was a little dryer, I used the metallic gold and repeated the brushing-and-dabbing process. Last, I used a tiny bit of copper colored Rub-n-Buff around the very edges, but you could do without that if you want. After this dried completely (didn't take very long), I liked the look, but it was a bit dull, so I used a glossy lacquer spray to make it shiny. I did three coats, with just a little drying time in between. 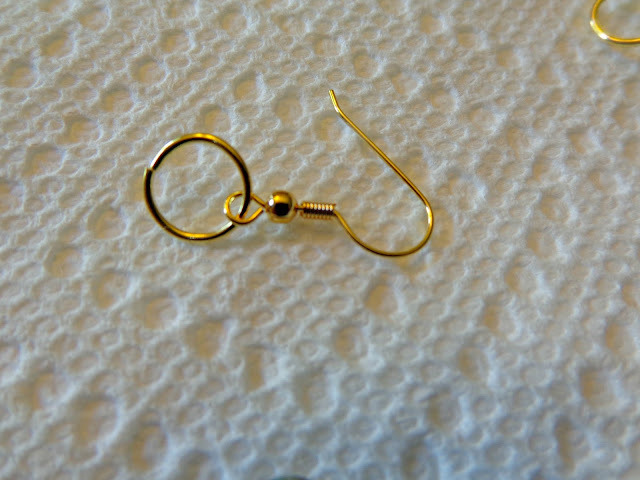 Next I took a jump ring and attached it to the earring finding. Using E-6000, I simply glued the jump ring to the back of the form, making sure the hook faced the correct direction and didn't get glued. 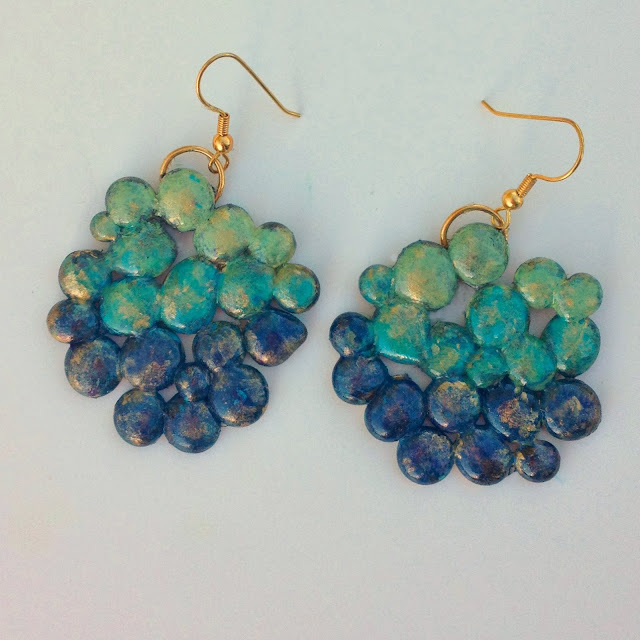 Once the adhesive dries completely, they're ready to wear and show off! 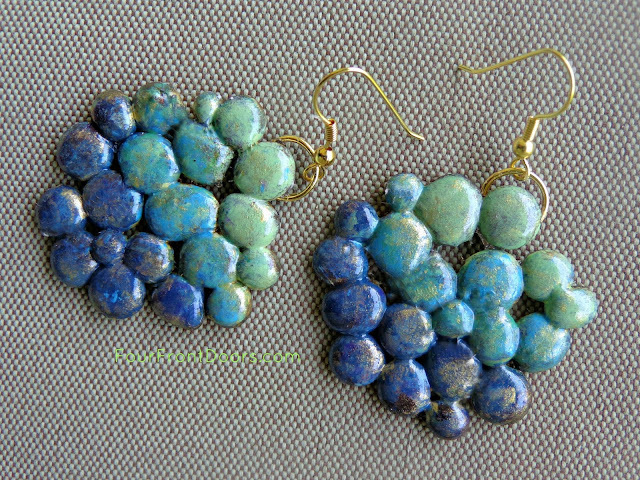 By the way, I saw similar earrings for $420, but these were SUPER CHEAP!! The only supplies I had to buy were the jump rings and the earring findings. Jump rings - $1.39 for a pack of 12 = 11.5 cents each. I used two, for 23 cents. 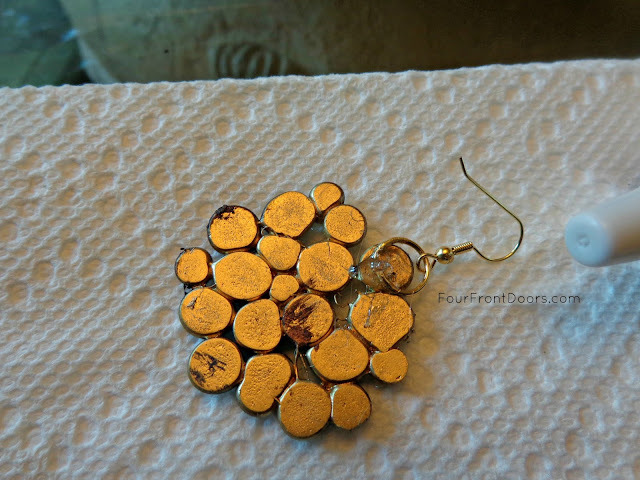 Earring findings - $1.39 for a pack of 8 = 17 cents each. I used two, for just under 35 cents. 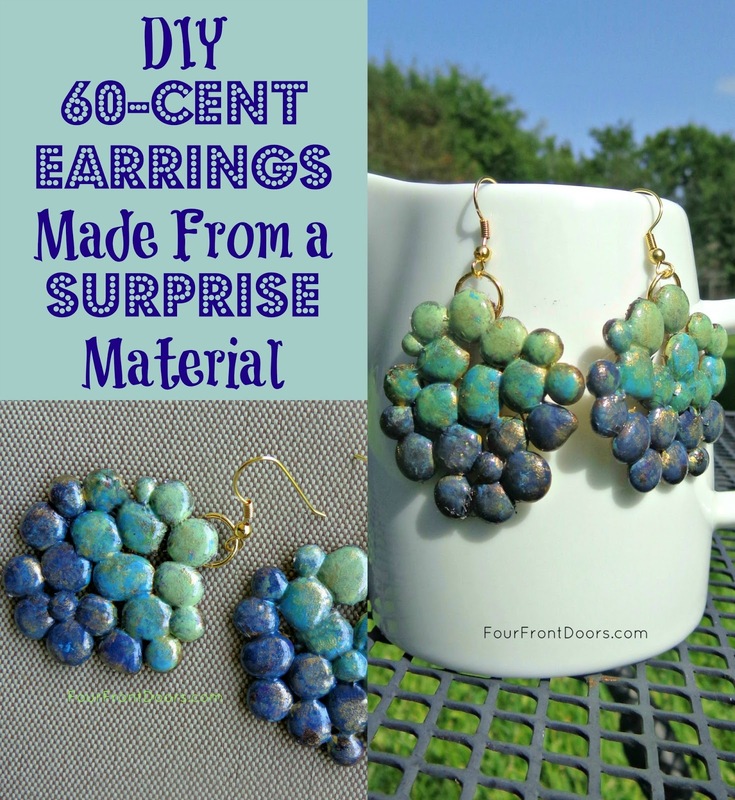 I already had everything else and used minimal amounts of each, so basically these earrings cost me less than 60 cents for the pair! Charlotte! These are amazing!! Great project. Charlotte - you are brilliant! Can't wait to try these myself. 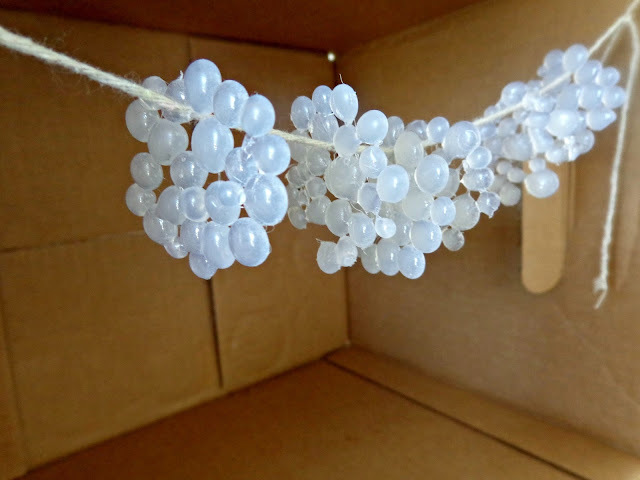 Did you try placing the jump ring into the hot glue glob before it cooled? I might try that when I test out your technique. Thank you for sharing! Thanks, Darrelyn! I didn't try that technique with the jump ring, but I considered it afterward. I think it might work as well or even better than the way I did it. If you try it, I'd love to hear how it worked! You are amazing I love these. I am gonna try them today. Did I mention that you are a genius. Wow! I'm so glad you like this! I love these!!! Thanks for sharing your genius with those of us who believe imitation is the greatest form of flattery... LOL... 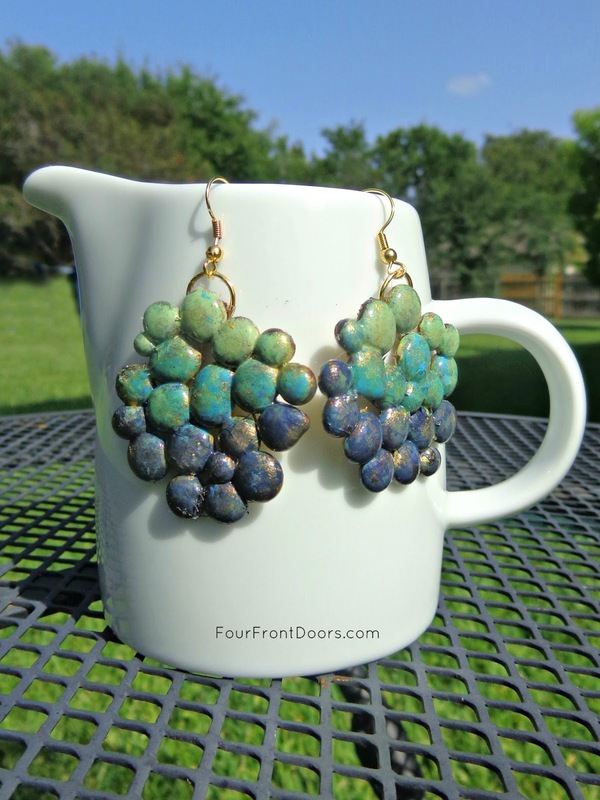 I wish I could see how others interpret your gorgeous earrings. I plan on making at least one pair,thanks again. Thanks so much for all your kind comments. I'm so flattered! These are awesome! I am flabbergasted! Love these - and like that they will be big - but not 'heavy'!!! What fun! strands, side by side...how bout squares? squiggles?How fun! Good question! I used high temp glue in a small gun. After I made each drop, I kind of hovered the gun tip over the glue drop (Without pressing the trigger) and very slightly swirled it to keep the strings to a minimum. I did have some strings too, and I was able to rub a lot of them off with my fingers (after they cooled). Any strings that were along the edge, I just cut off with a blade. But once you paint and spray them, they seem to disappear. I made several (as you see in my pics) partly for this reason, so I could choose the best of the bunch. You'll notice mine DO have strings (see the gold pic and the one after the first coat of paint colors). I think the final coating with gloss makes a big difference and is key to disguising the stringy bits. Good luck! Great! Thanks for your help! J. So love these, will be trying very soon with the Fall season approaching. Thanks for sharing. Guess what .. I found neon glue sticks as well as glow in the dark glue sticks at Walmart today!! A easy way to brighten up this trick : ) I'm trying it now.. Thanks for sharing ur creativity!! Wow! Sounds like a few big steps saved, and what fun! Feel free to send us pics of your finished project! Glad you liked it. Thanks for the comment! wow this is a great and cheap idea love it! What about gluing a backing onto them? Something like felt would give it stability without adding weight and make them last longer. Absolutely clever! Got to try this! These are so cool. I think you could make a necklace to go with them. Gonna try to make these. I agree with Cynthia, a statement necklace would be fab! Wow, these are stunning Charlotte, who would have thunk!! 😉 I'm not a big fan of earrings (for myself, at least), but I think I'm gonna try this as a brooch, so original!! cartilage hoop earringsReally very informative content is here, thanks for sharing such info. Just LOVE these and plan on making some for Xmas gifts this year. Has anyone tried to make different shapes such as a long oval instead of a circle???? Why not use colored glue sticks to begin with. Then use the gold rub and buff Just wondering. 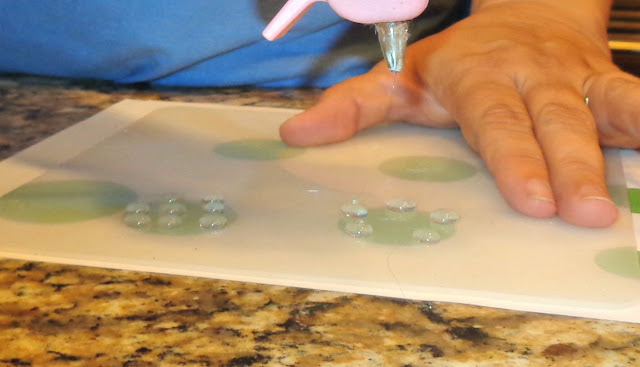 You do know that you can tint Elmer's glue and make glue dots too..Works and they are so pretty then just glue together. Just made several of these without the earring bit. Painted them gold and gonna get some more paint on when then that dries. Then gonna hook them together as a necklace instead. My best friend is gonna LOVE it as a christmaspresent, it is so her. Thank you so much for sharing these beautiful creations... Superb! Are they light or heavy? So amazing! Thank you! I have seen this done with metal clay which is more difficult and a lot more expensive!! Thank you so much!! I do LOVE that earrings. Are you interesting by selling it by any chance ? i will use it on my Anarkali Suits. Wow, so beautiful. I like this diy tutorial so much. It's Time for Summer Bingo!